AlinO.-Linear drain is ideal for curb less shower of large format tile. AlinO Linear drain made out of 304 stanless steel to protect against corrosion. "Two-in-one" (SS Grate & Tile Insert) grate provides modern look, and can be converted from stainless steel grate to tile insert very easily. It comes with 2" pipe outlet and odor protector.Height Adjustable feature can allow to install any tile thicknesses. It's available in different finishes and sizes. Luxury Drains Linear Shower Drain Tile-in, 36 inch. Geotop Linear Shower Drain 36 Inch. 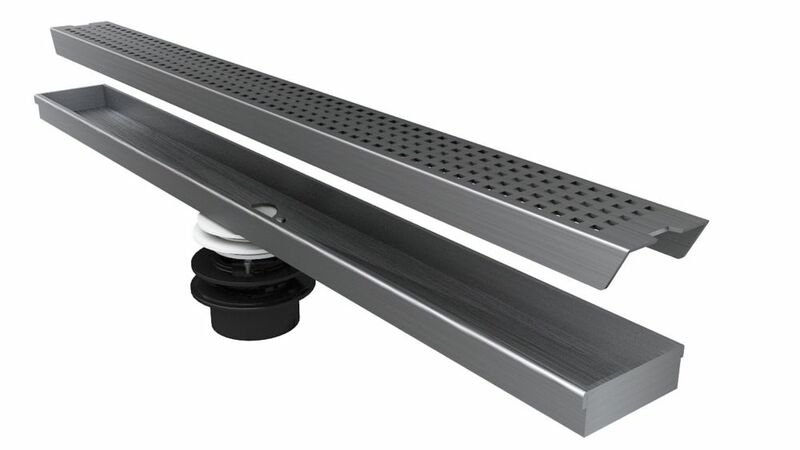 Length in a Brushed Satin Stainless Steel Finish Home Depot and JAG Plumbing Canada products bring you a Selection of Quality Linear Drains manufactured by the Canadian based Shower Grate Shop.